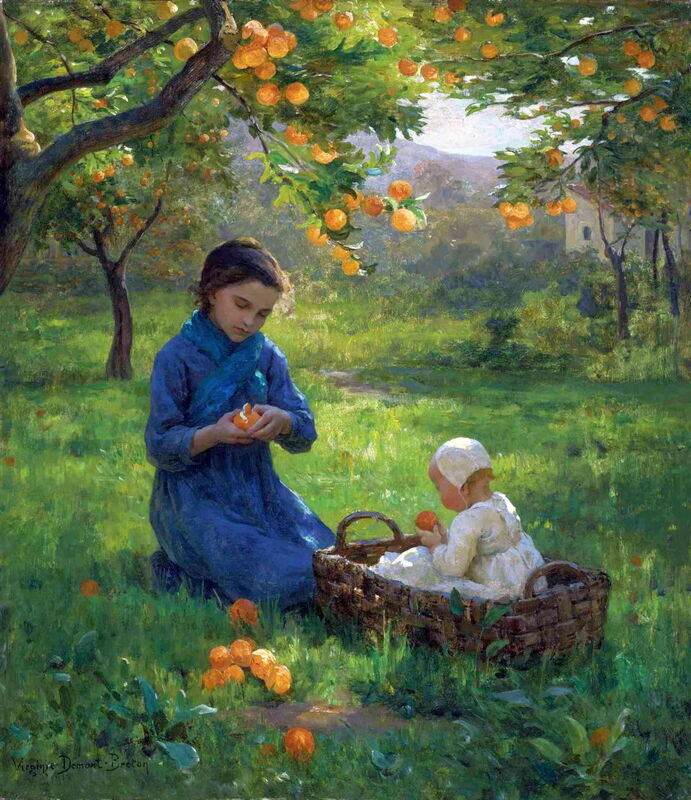 Virginie Demont-Breton (1859–1935), Under the Orange Tree (date not known), oil on canvas, 61.5 x 53.3 cm, location not known. The Athenaeum. Although it is fairly widely known that Jules Breton had a daughter, Virginie Demont-Breton (1859–1935), who went on to paint, I had not realised just how successful she was, and how distinctive and delightful her paintings are. As is usual for women artists, lamentably few of her paintings are available as usable images, and little is reported of her career. This article is as much as I know. She was born and named Virginie Élodie Marie Thérèse to Jules and Élodie Breton, in Courrières, inland from Calais on the north-east coast of France, on 26 July 1859. She was a precocious artist, and had her first work accepted by the Paris Salon in 1879 when she was still nineteen. 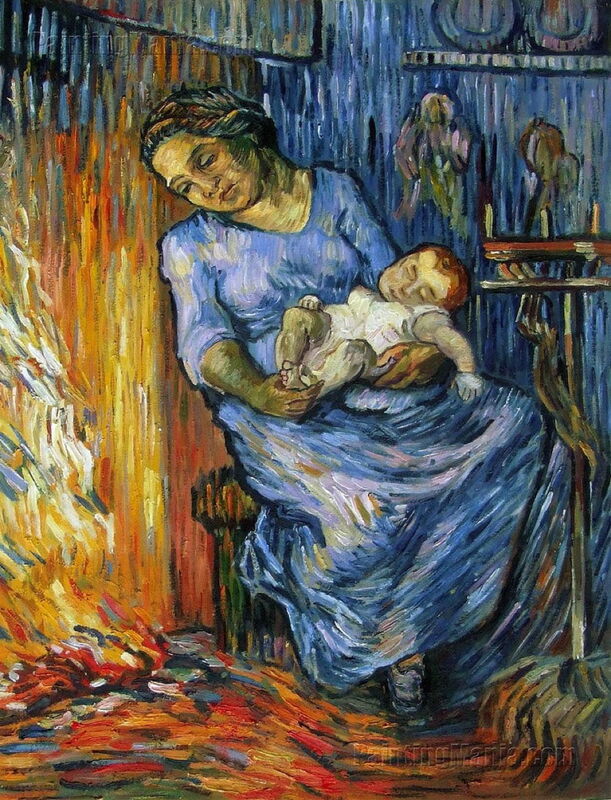 She married the painter Adrien Demont the following year, after which she signed her paintings as Virginie Demont-Breton. Virginie Demont-Breton (1859–1935), First Steps (1881-2), oil on canvas, 90.1 x 60.3 cm, Private collection. Wikimedia Commons. In her early career, she specialised in painting mothers with their young children. Her First Steps (1881-2) was exhibited at the Académie Royale des Beaux-Arts de Bruxelles in 1881, although it is dated 1882, and was shown in the Salon in 1882. From there it was sold to Goupil, who sold it to the USA, a market in which, like her father, she did well. She was awarded a gold medal at the Exposition Universelle in Amsterdam in 1883, although I have been unable to identify which work(s) brought her that distiction. 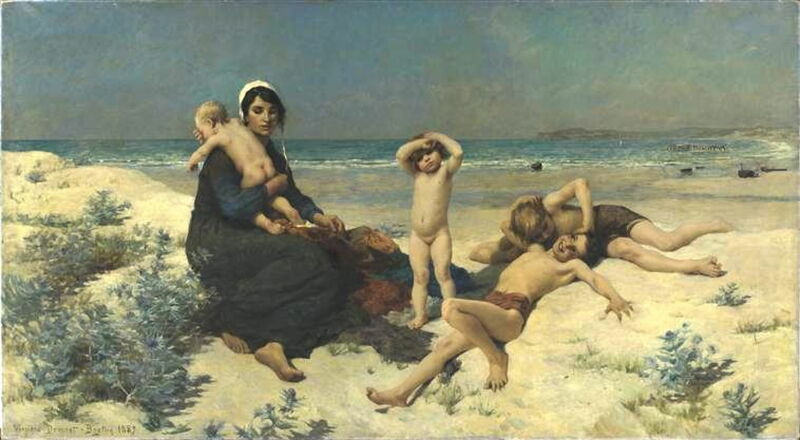 The Beach (1883), which was painted on the Channel coast, was exhibited at the Salon in 1883, where it earned her ‘hors-concours’ (because of exemplary record, her works didn’t need to be submitted to the jury in future), and was purchased by the state. That year, she joined the French Union of Women Painters and Sculptors, and was its president from 1895-1901. Among her achievements for the Union was the full admission of women to the École des Beaux-Arts in Paris, and their eligibility for the competition for the prestigious Prix de Rome. Virginie Demont-Breton (1859–1935), L’homme est en mer (The Man is at Sea) (before 1889), oil on canvas, 161 x 134.5 cm, location not known. Wikimedia Commons. 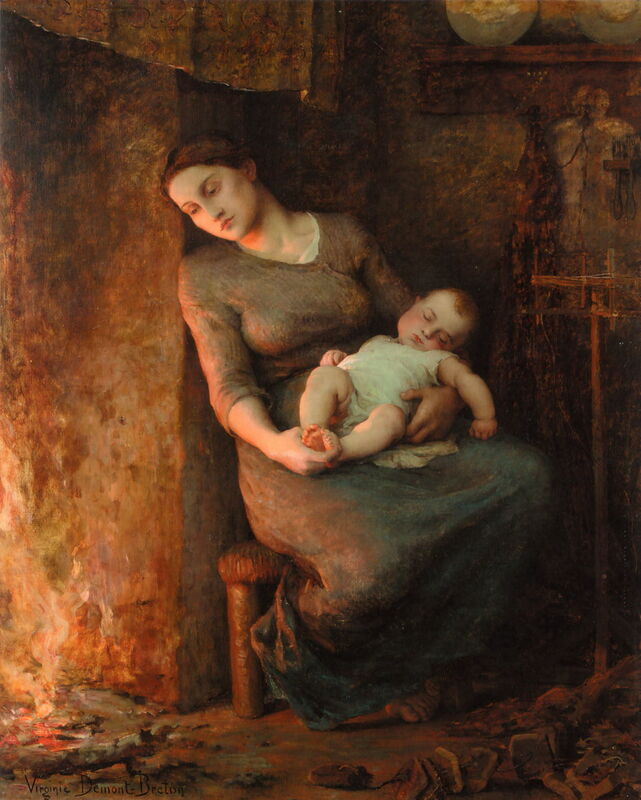 L’homme est en mer (The Man is at Sea) (1889) is probably her best-known painting, and shows a fisherman’s wife warming herself and her sleeping infant by the fire, while her husband is away fishing at sea. It was exhibited at the Salon in 1889, where it was rapidly engraved for prints. Vincent van Gogh (1853-1890), L’homme est en mer (The Man is at Sea, after Demont-Breton) (1889), oil, dimensions not known, Private collection. Wikimedia Commons. The reason for the fame of that painting above is in part because of Vincent van Gogh’s copy, L’homme est en mer (The Man is at Sea, after Demont-Breton) (1889), which he painted when he was undergoing treatment in the Saint Paul asylum at Saint-Rémy. Van Gogh based his copy on a printed reproduction. In 1890, she and her husband moved to the small fishing village of Wissant, on the Côte d’Opale between the capes of Blanc-Nez and Gris-Nez, between Calais and Boulogne. The following year they started construction on a villa in neo-Egyptian style which they named Typhonium, and is now a preserved historical site. Their house became the focus of a group of artists known as the Wissant School, which was active until the early twentieth century. Members included Félix Planquette, Fernand Stievenard, Valentine Pépe, Henri and Marie Duhem, and Virginie and her husband Adrien. Virginie Demont-Breton (1859–1935), Portrait of Marie Duhem (detail) (1889), oil on panel, dimensions not known, Musée de la Chartreuse de Douai, Douai, France. Wikimedia Commons. 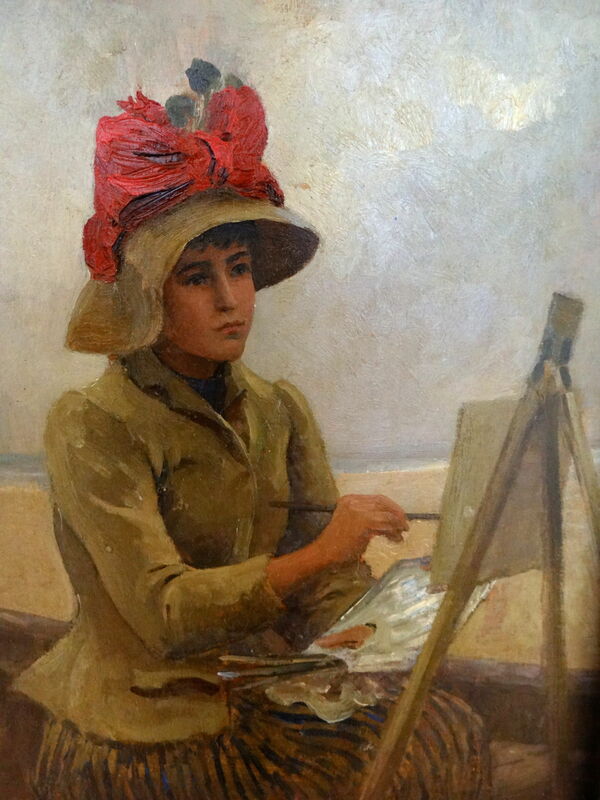 This detail of Virginie’s Portrait of Marie Duhem (1889) shows one of their close friends and colleagues in the Wissant School, at work en plein air on the coast near their house. In 1893, Virginie was among the French women artists who took part in the Chicago World’s Columbian Exposition, forming its Woman’s Building. This monochrome reproduction of Stella Maris (1894) is one of Virginie’s many paintings using maritime motifs, which she developed after they moved to Wissant. Stella Maris is a popular name for Polaris, the Pole Star, which has been used since ancient times for celestial navigation, but the artist’s principal reference here is to its use as a traditional synonym for the Virgin Mary. 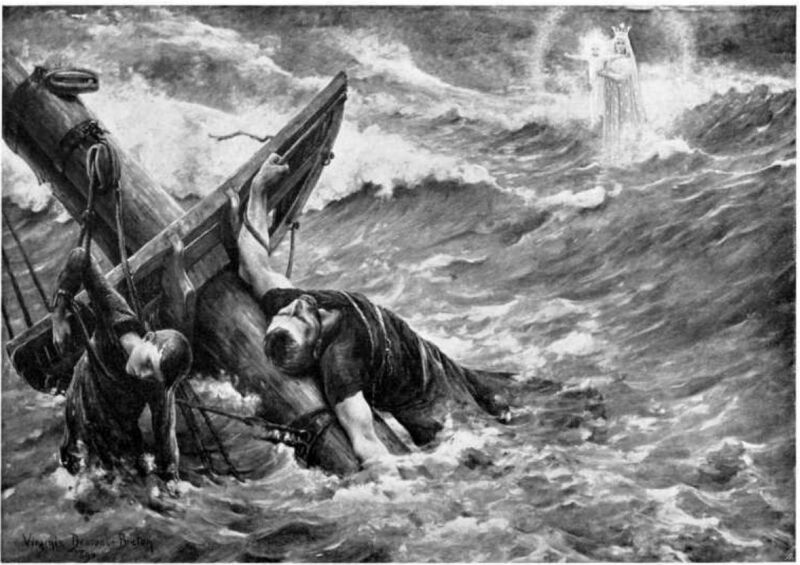 The wrecked mariners clinging on to the rigging have been joined by a vision of the Virgin Mary, who bears the infant Jesus in her arms. 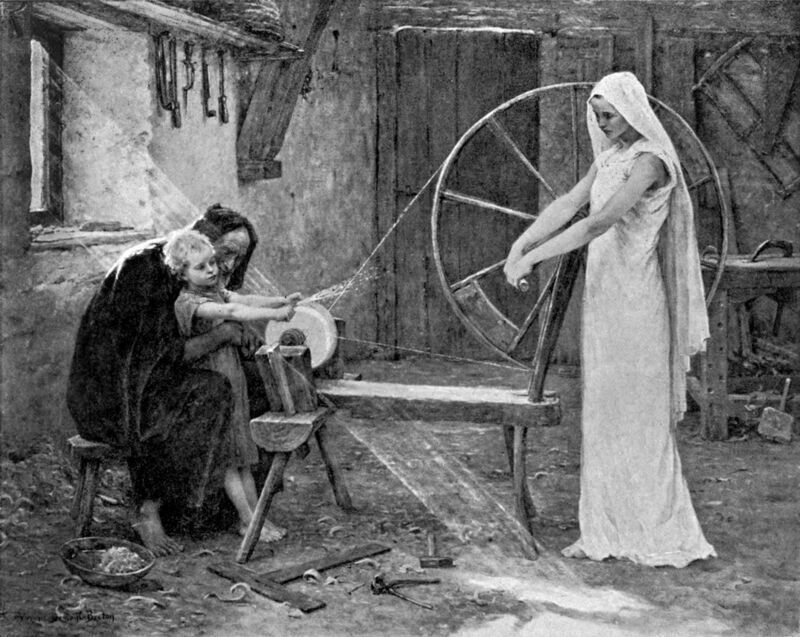 This painting was exhibited at the Salon in 1895, and the print comes from a 1905 book on Women Painters of the World. In 1894, Virginie was admitted to the Legion of Honour, and in 1896 was recognised by the Rosati Society for her achievements. Virginie Demont-Breton (1859–1935), Into the water! (c 1898), oil on canvas, 182.1 x 122.5 cm, Koninklijk Museum voor Schone Kunsten, Antwerp, Belgium. Wikimedia Commons. She continued to paint intimate family scenes around the Channel coast. Into the water! (c 1898) shows a fisherman’s wife taking her young children for what may well have been their only opportunity to bathe properly. 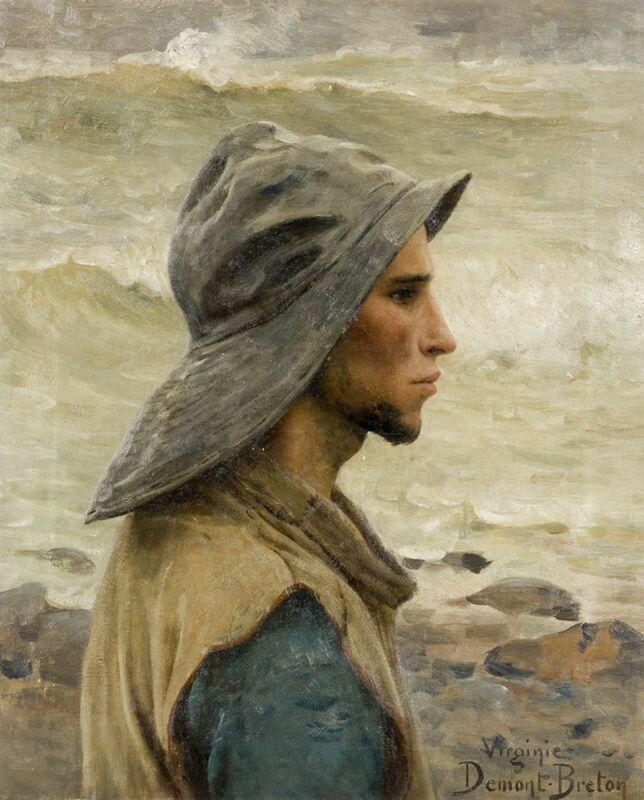 Virginie Demont-Breton (1859–1935), Men of the Sea (1898), oil, dimensions not known, Musée de Picardie à Amiens, Amiens, France. Wikimedia Commons. 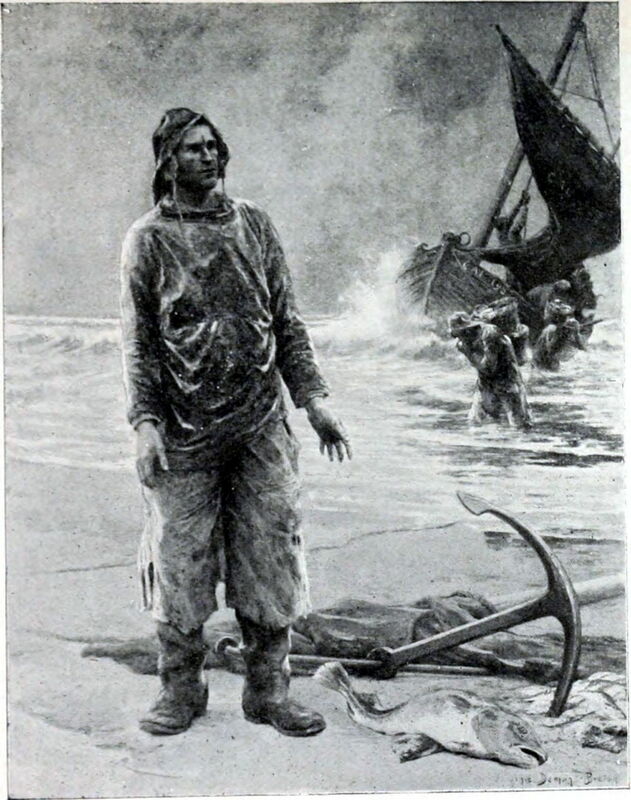 Men of the Sea (1898) is another monochrome reproduction of a full-colour original painting, showing the fishermen of Wissant landing their catch on the beach. This compares with her father’s earlier (1879ish) paintings of fisherfolk in Brittany, and Winslow Homer’s famous paintings from 1881 of those at Cullercoats, north-east England. 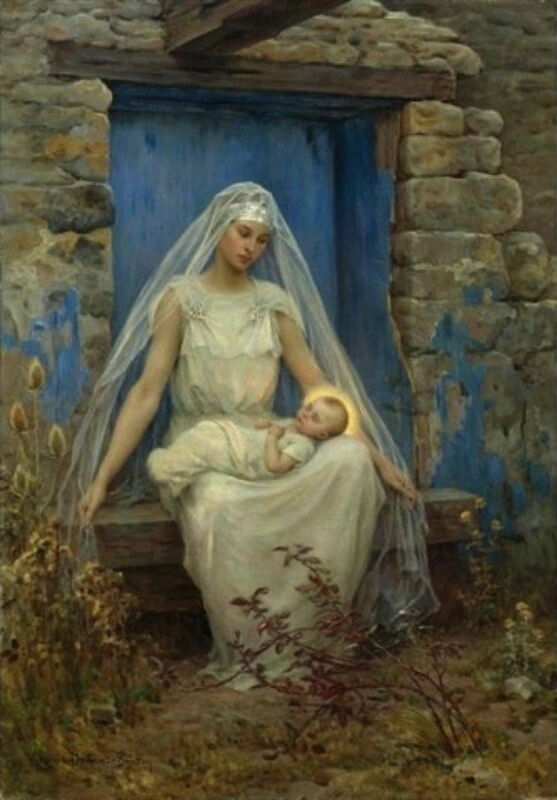 Virginie Demont-Breton (1859–1935), Première audace premier frisson (First dare, first thrill) (1900), oil, further details not known. Wikimedia Commons. 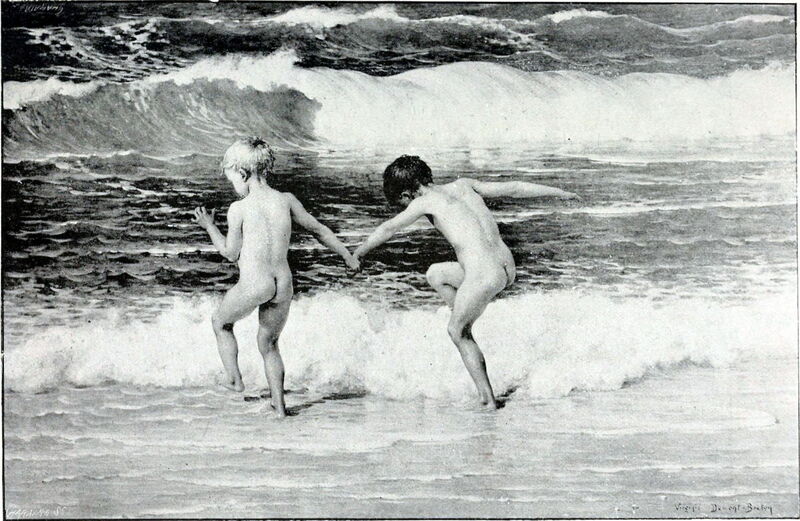 Première audace premier frisson (First dare, first thrill) (1900) is a monochrome reproduction, again, showing two young children entering the water at Wissant. This painting was exhibited at the Salon in 1900. Like her father, later in Virginie’s career she turned to writing poetry and prose, in which she was also successful. Her collected poems were published in 1920, and four volumes of memoires between 1926-1930. She died in Paris on 10 January 1935. Among her undated works are the following. 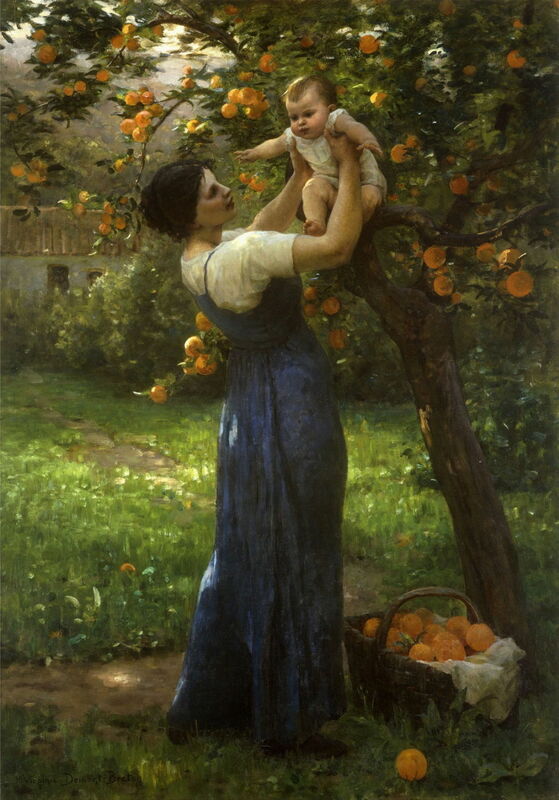 Virginie Demont-Breton (1859–1935), Mother and Child in an Orange Grove (date not known), oil on canvas, 102.2 × 69.8 cm, Private collection. Wikimedia Commons. Mother and Child in an Orange Grove (above) was probably painted in the south of France, as was Under the Orange Tree (below). Alma Mater is an unusual version of the Nativity, in which the Virgin Mary’s traditional blue has been transferred to the painted plaster behind her, so that she can be dressed in white. Virginie Demont-Breton (1859–1935) Le Divin Apprenti (The Divine Apprentice) (date not known), oil, further details not known. Wikimedia Commons. Le Divin Apprenti (The Divine Apprentice) is a monochrome reproduction of a full-colour original. This shows the Holy Family in Joseph’s carpenter’s shop. The elderly Joseph guides Jesus in sharpening a knife on a whetstone, which is turned by his mother Mary. Sunlight cast through the window illuminates the boy’s head. This compares with John Millais’ famous Christ in the House of His Parents (1849-50). Virginie Demont-Breton (1859–1935), Young Fisherman Watches the Sea (date not known), oil, 61.5 x 50 cm, location not known. Wikimedia Commons. Young Fisherman Watches the Sea is a thoughtful portrait of a young man whose future depends on his abilities to survive at sea. Note how painterly are the waves and other details in the background, which are also deliberately defocussed. Although there are no books devoted to her work, as far as I can discover, a catalog raisonné is being prepared, which will be a major step forward in documenting her paintings properly. Not as great a modern Master as her father, perhaps, like the work of the women Impressionists, she broadened the appeal of painting, and was important in opening up art as a career for women. She deserves much greater recognition. Posted in General, Painting and tagged Breton, Demont-Breton, Homer, Millais, painting, realism, van Gogh, Wissant, women in art. Bookmark the permalink. Wonderful! I love her paintings! Beautiful! It’s always wonderful to learn of a new-to-me female artist. So often they become lost in time. Thank you. It is unusual to find sufficient available images to give such a clear idea of a woman artist. Her mother and child paintings are some of the most insightful and joyous celebrations that I have seen. I’m doing an assignment on her and it’s so cool as I get to learn more about her and love her works. Thank you: I wish you success with the assignment. She was very successful at the Salon in the 1880s, and quite a famous artist then. It seems tragic that she has almost been forgotten now. Thank you and yeah I’m having trouble finding enough info about her art even though she was so great. There’s a little about her most successful Salon in 1883 here. You might also search on ‘Paris Salon 1883’ to see old critics and material from that time, which may contain helpful information too.